You are here: Home / WordPress Tutorial For Beginners / How do I enable or disable comments on my website? 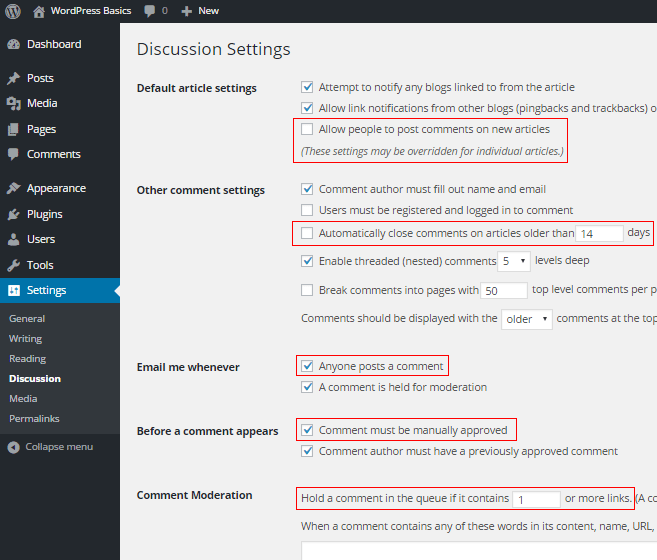 WordPress websites have a feature called comments. 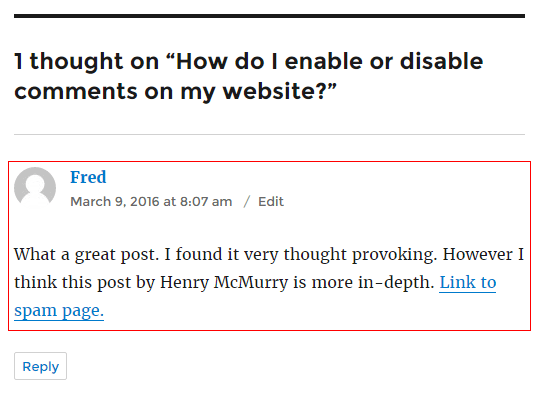 This allows your site visitors to type their own comment below your blog post or web page. Comments can be a great way for you to interact with your site visitors. By adding comments to your posts, your site visitors can feel like they are a real part of the conversation, not just a reader who is passing by. Comments also allow people to gain access to your site visitors. And this is just what marketers and spammers are looking for. A popular website can get hundreds or even thousands of spam comments every day. I’m not exaggerating. 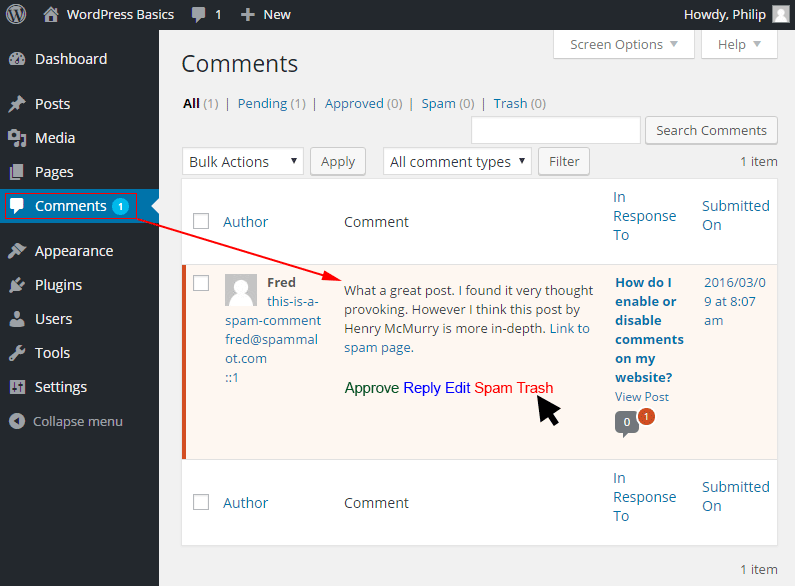 Out of the box, WordPress will hold the first comment someone makes until you manually approve their comment. But the second, third, fourth comment they make will be automatically approved because you have approved their first comment. And WordPress now thinks you trust them. This means that people will leave comments that look real. But the comment is just there to enable the commenter to get past the first comment restriction. By approving the first comment by any individual commenter, you can open the floodgates to that person as a potential spammer. Look carefully for comments that are vague and could apply to any website. Such as: Great post I enjoyed this tremendously… etc. The best option is to manually approve all comments until your site starts to get popular, then use Akismet to guard against spam comments. Aksimet is free for non profit sites but you have to pay to use it on a business site. Read Akismet‘s terms and conditions! 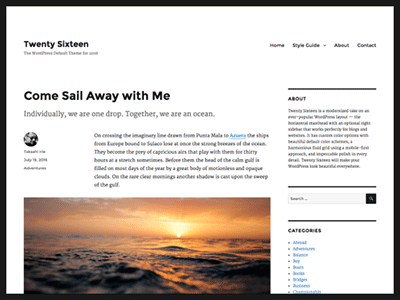 Previous Post: « How do I put content in the sidebar or footer of my website?